National Drive Electric Week just keeps getting better, friends. Yesterday, I hit the road to Fargo in the Bolt with my Minnkota communications teammate Ben. 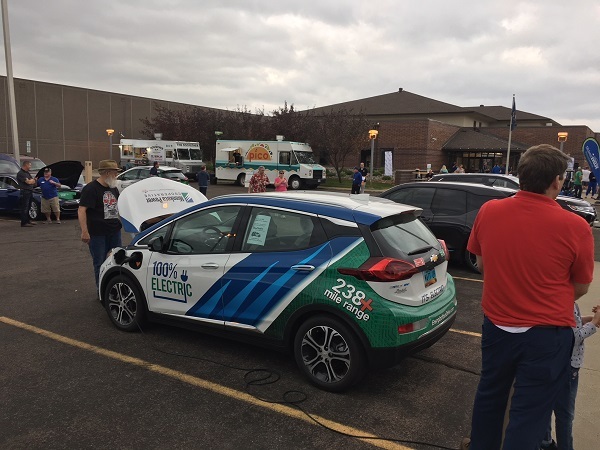 We were heading to Cass County Electric's EV Tailgate Party – the cooperative's way of celebrating electric vehicle innovation. Minnkota was happy to help by providing free t-shirts for attendees. Plus, we could talk about our own all-electric vehicle and gather some information from other plug-in owners in the area. And – Border States Electric sponsored free grub from local food trucks in town. Was this heaven? The Chicago-style hot dogs and chicken tacos said yes. Nearly two dozen plug-in vehicles – from cars to bikes to buses – were staged for the perusing public. Minnkota wanted to be sure that tailgate goers were outfitted for Drive Electric Week. Free shirts for everyone! Ours was one of about 20 electric and hybrid vehicles parked in the front lot. Some of the attendees were from cooperatives like ours, while others came from dealerships and other organizations. 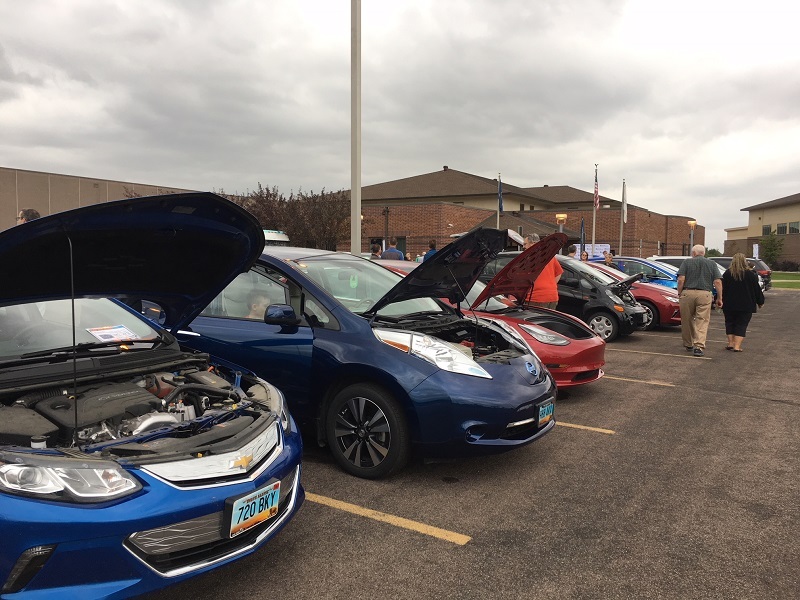 But the biggest turnout was local owners – folks who brought their Chevy Volts, Nissan Leafs, Teslas and more. 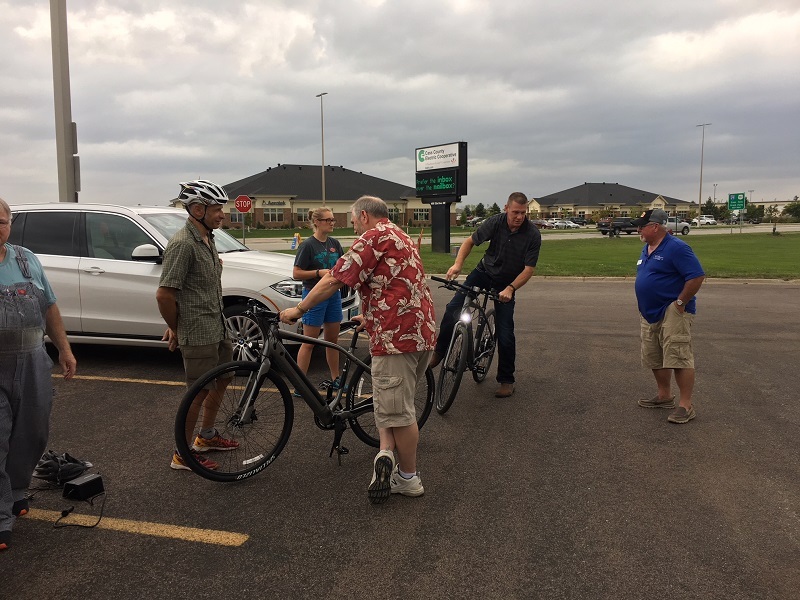 Cass County Electric offered ride-alongs in its Chevy Bolt and curious commuters could try out electric bicycles. For those who were seriously considering going all-electric, industry experts were on hand to answer questions about home charging station rebates and how to take advantage of a phenomenal off-peak charging program. It was enough for even the most cynical driver to want to hop on board. The event drew a great crowd that wasn't slowed by an occasional drizzle. The conversations about electrification kept rolling through the evening. The electric bikes were a hit with the kids. And, who am I kidding – with the adults, too. I had a great chat with Dan Widman from Grand Forks, owner of the famous Widman's Candy Shop (if you haven't had the Chippers there, make a point to stop and try them). "I should have brought candy down, but it would have weighed the car down," he joked, motioning to his 2017 Tesla Model X 100D. But it would take a lot of chocolate to slow that car down, with an all-electric range of just under 300 miles and the ability to go from 0-60 in less than three seconds. 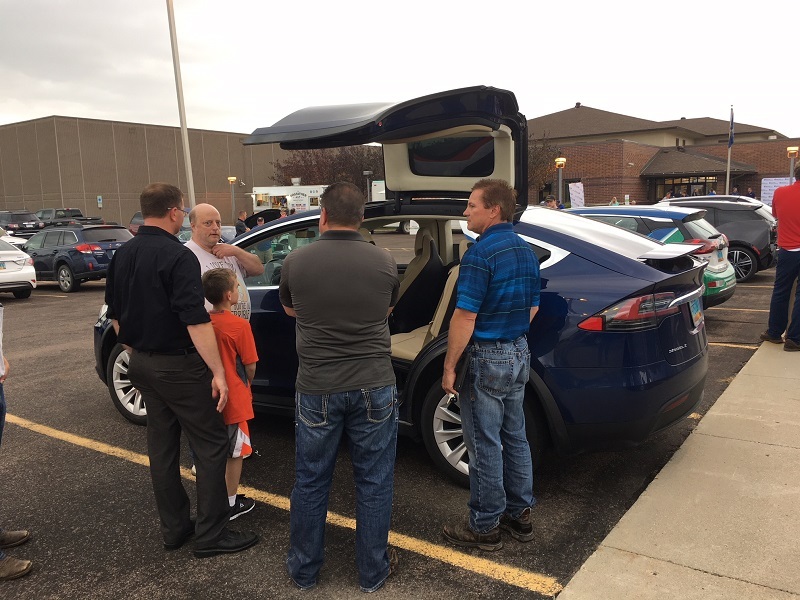 Grand Forks' Dan Widman shows off the features of his Tesla Model X 100D, which he says he bought after spending too much money to fuel up his pickup. I talked with a lot of attendees who admitted they were drawn in by the delicious dinner, but who were now seriously considering a plug-in car as their next vehicle. Tatiana Rodriguez was joined by her husband and daughter for a stroll among the EVs. "Going electric, you can save so much in the long run," she said. "It would definitely be worth it for me." Local TV station KVRR was there and shot a terrific piece for the 10 p.m. news. Cass County Electric's Bob Miller is a killer spokesman! Go Bob! After the event, we found our new EV friends from Fargo, Bill and Jim Brooks (featured in yesterday's blog), who offered to let us test out their Tesla. We tried out the heart-stopping acceleration, the different handling modes of the car, and the incredible autopilot feature that assesses lane lines and keeps you cruising within them, even on curves. A flip of the blinker will change lanes for you, with advanced safety measures keeping you out of harm's way. Ben was the first to take the wheel of Bill Brooks' Tesla. I giggled listening to his reactions from the backseat. 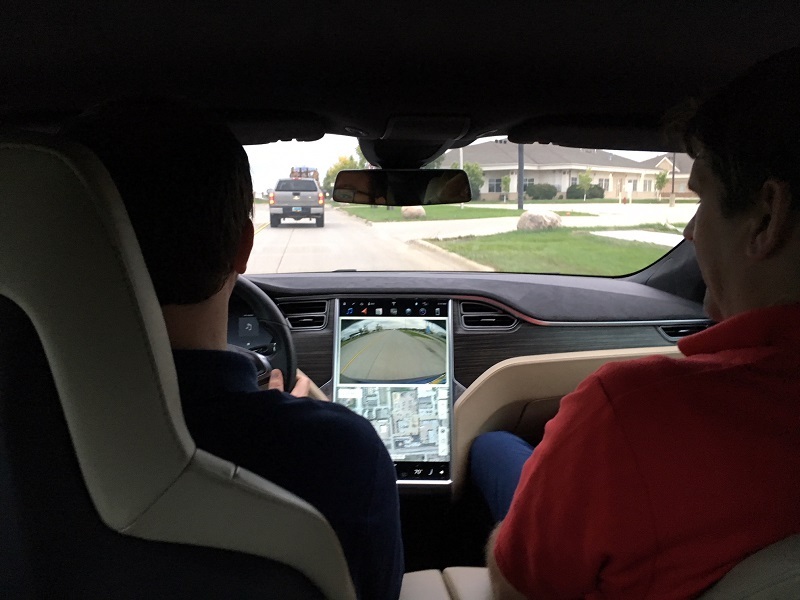 The Tesla's autopilot feature allowed me to drive hands-free down the interstate. As you can tell by finger gnawing, I had feelings about it. Bill noted that many times all it takes is getting someone behind the wheel of an electric car to really show them that this technology can easily become a part of their lifestyle. The performance of EVs, combined with the financial and energy benefits, round out a perfect package of transportation benefits. Thanks again to Cass County Electric for inviting us to take part in this excellent event. 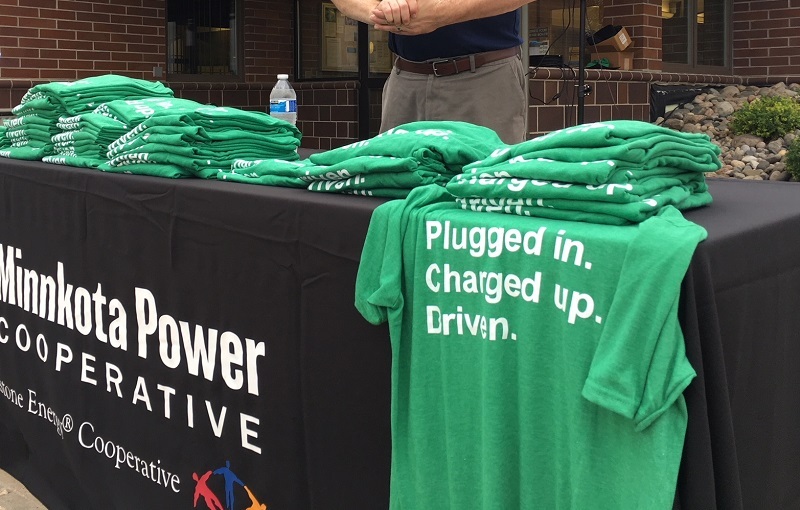 I can't wait to chat with folks at the Greenway Takeover Festival in Grand Forks today – come see the Bolt and ask me questions about electric vehicles! Remember to snap a photo with the car and post it with the hashtag #ISeeTheEV for a chance to win money for your favorite cause!